Free-trade agreements between China and Switzerland and China and Iceland took effect on Tuesday, marking a new dawn for business between the countries. The agreements, which apply a zero-tariff policy to a wide range of merchandise, covers areas including government procurement, employment cooperation and intellectual property. Under the agreement, 99.7 percent of imports from China to Switzerland will be exempted from customs duties, while 84.2 percent of Switzerland's exports enjoy the same policy. Duties on China's exports including textiles, clothes, auto parts and metal ware will be reduced substantially. 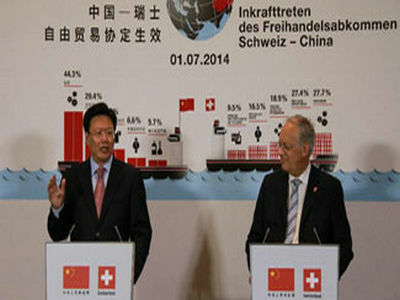 Trade between Switzerland and China increased 126 percent year on year to 59.5 billion U.S. dollars in 2013. China is Switzerland's largest trade partner in Asia, while Switzerland is China's fifth-largest trade partner in Europe. Trade between China and Iceland stood at 220 million U.S. dollars last year.